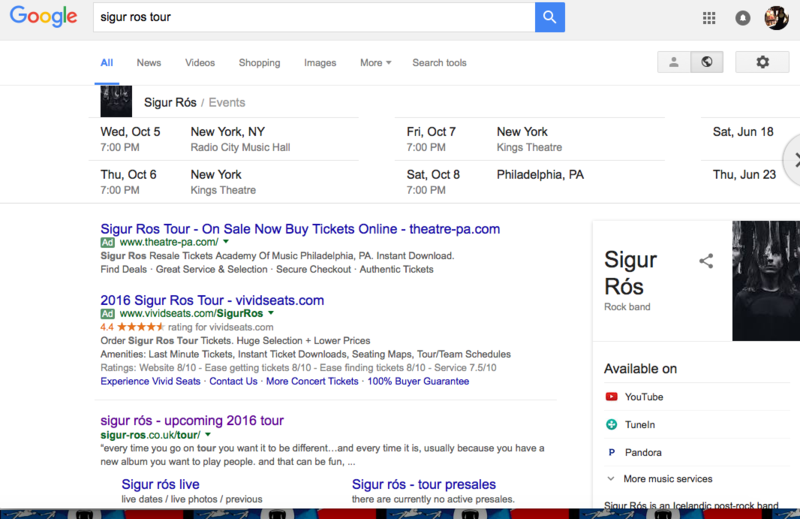 Hot damn, Google now has concert tour information for your favorite acts. 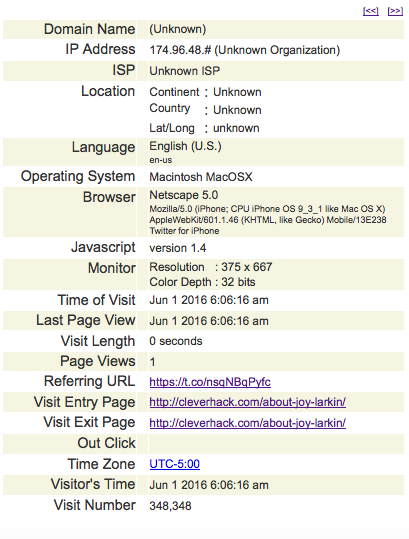 The tour info appears to be geo-located and apparently works whether you are logged into your Google account or not. As I write this, all of these are upcoming touring acts for the Philadelphia, PA area. 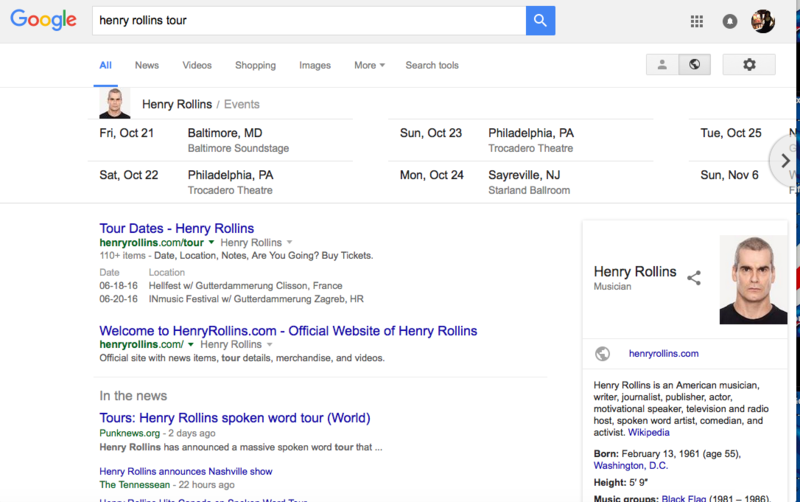 So I wonder how tour pages can be optimized for Google. 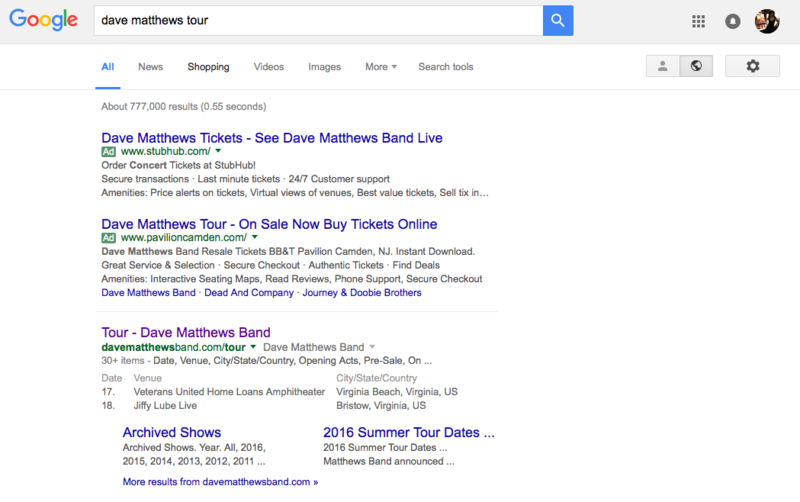 For example, if you search Dave Matthews tour, the tour dates don’t explicitly show. 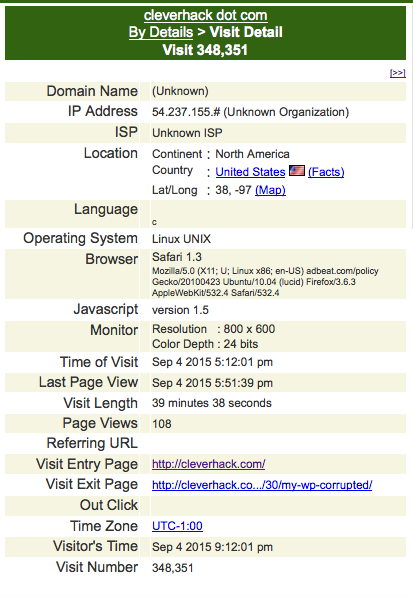 On the other hand, the links to venues and to buy tickets are buried in another layer of the Dave Matthews Web site. My best guess right now is that if a tour page links out to venue/ticket information, it gets preferential treatment in Google results. For the past few weeks, I’ve been on the receiving end of list notifications that look like the following. Seeing a list notification is nothing new, but this *cough* “Twitter growth strategy” *cough* appears to be awfully automated. Up until a few weeks ago, I observed a different attention grabbing tactic where I would initially see a list notification or an actual follow. Then, a few days later, the new (to me) account would favorite an old - could be days or event months old - tweet which somehow intersected with their interest. (Let’s just say a good number of so-called marketing and other B2B services used this strategy, and not too many consumer or personal Twitter accounts.) When I still didn’t follow back within 24 or 48 hours of the favorited tweet (there was no engagement with me otherwise), the account would then unfollow me. It’s one thing if I noticed this scenario once or twice. For a while I was seeing several accounts try this “growth strategy” *each day*. The faux engagement actions are questionable enough, but the automation of faux engagement is…off-putting. I don’t know what social media marketing program is enabling these Twitter “growth hacks”. 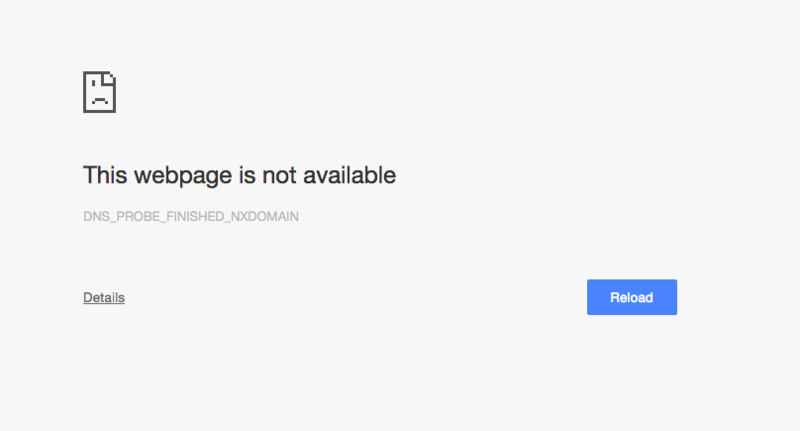 Below is a screenshot of the error message Chrome provides when a Web site refuses to load because there is no needed redirect from the non-www to the needed www version. A) Why doesn’t Chrome automatically try to redirect like modern Firefox does? 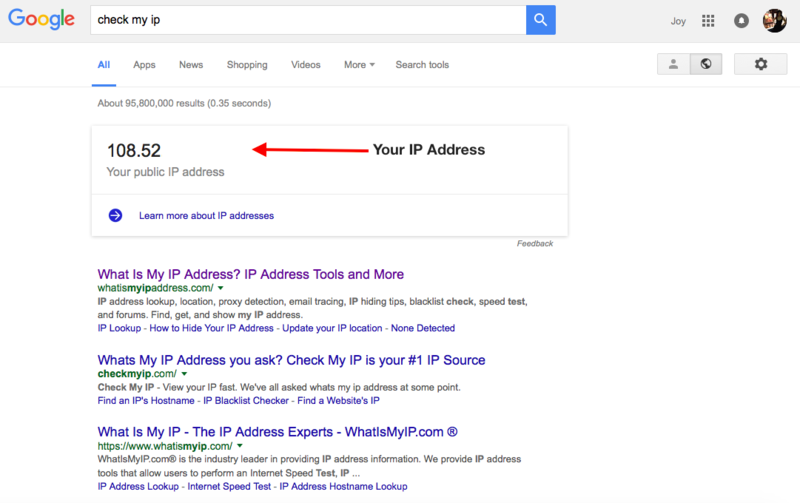 B) Not like anyone but a Web developer would even recognize what DNS_PROBE_FINISHED_NXDOMAIN even means. C) Yeah, I know the fault is technically on the Webmaster’s side on this one, but still, a browser should try to correct. Not too long ago, a few of us on Twitter mused about getting rid of certain social media apps on our phones. They’re a distraction or they promote unhealthy habits. One Twitter user mused about the effects of losing such apps. What about pictures on your phone. Here’s how a Facebook-less iOS install “shares” to an app. 1) First, select a picture from your photo roll. 2) Then, choose the picture by selecting the checkmark at the lower right hand corner. 3) Finally, in the Share Sheet, select the app you want to send the picture to. tl;dr If there is an app icon in the iOS Share Sheet, you can share an image to that app even if the app is not currently installed on your phone. It’s a cold Saturday morning, and my friend, noted author, volunteer firefighter and techno aesthete John Sundman posted the following Twitter query. I have a few pictures, same dimensions, that I want to assemble into 1 jpeg banner. 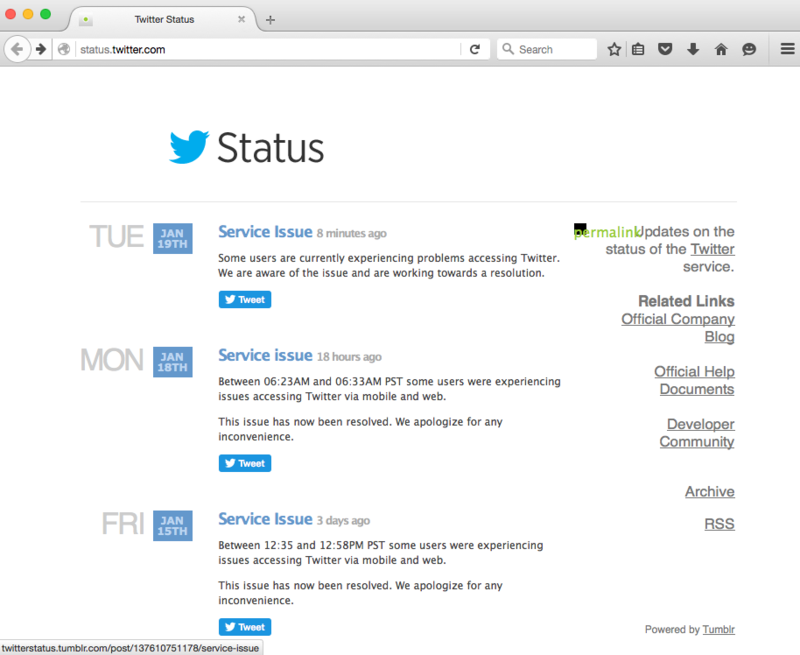 What's easiest way to do that on a mac? Thanks. Ah ha! A question with an answer I stumbled on a few days ago. 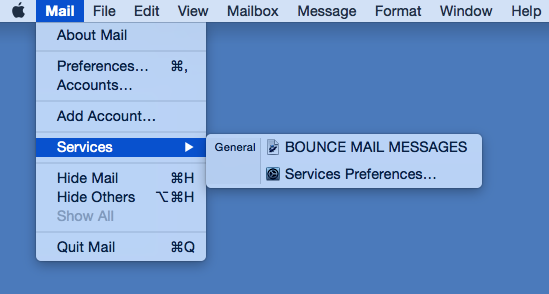 To make a quick image, like a banner, out of similarly sized images on a recent Mac, here’s a quick hack. 1) Determine the size of your image. For the purposes of this exercise, let’s use 600 x 200px. 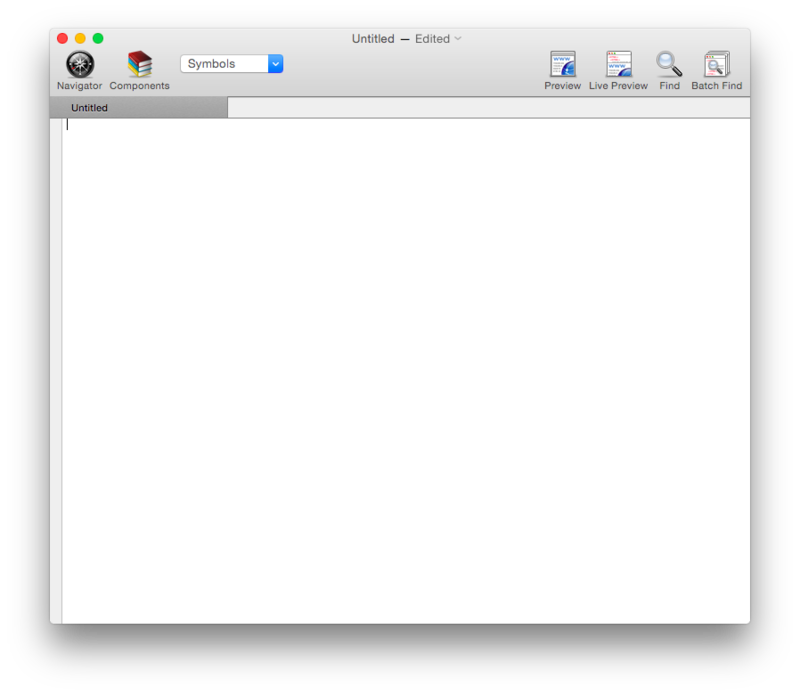 2) Open up a blank page in whatever easy text editing program you prefer. Myself, I prefer Taco HTML Edit. 3) In the text editing program, take a screenshot (CMD + SHIFT + 4) of an image in a size roughly approximate to your desired image size. 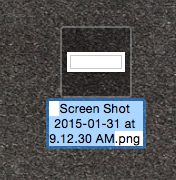 4) Rename the blank screenshot to something easy to remember. Perhaps, mybanner.png. 5) Open the blank screenshot (mybanner.png) in Preview.app. 6) Resize the blank screenshot to your desired image size (Tools > Adjust Size), in this case 600 x 200px. Save your resized image. 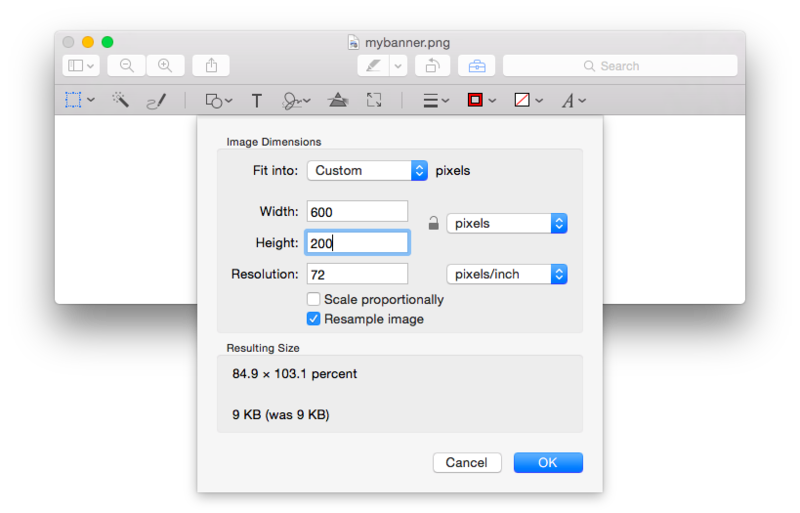 7) Open the other images you wish to work with in Preview.app, edit them as desired, and Copy + Paste the images into your blank screenshot (mybanner.png). 8) Continue editing and don’t forget to save your work!